Paytm’s rise in the payments space this year has been meteoric, but there are now that signs that incumbents might be getting a little uncomfortable. SBI’s official Twiiter account has said that its internet banking users can no longer transfer money to their Paytm wallets. And in candour that’s unusual in the corporate world, it says it “recommend(s) using State Bank Buddy mobile”, their own wallet. @AnirudhNaik24 Happiness is guaranteed at Paytm. If we fall short of your expectations, give us a shout. #Paytmkaro! 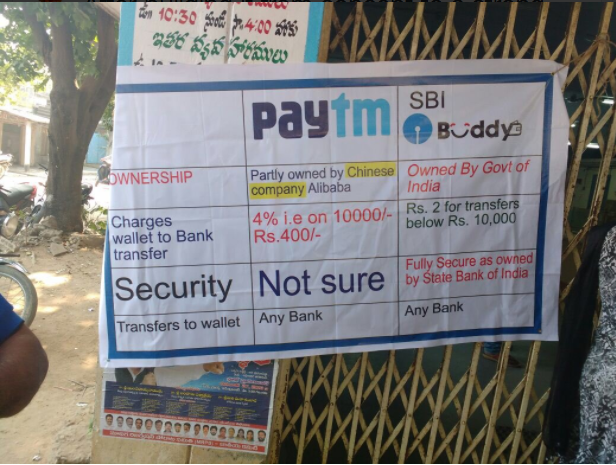 This isn’t the first time that SBI has trained its guns on the new upstart in the payments space – Paytm founder Vijay Shekhar Sharma had earlier shared a picture supposedly outside an SBI branch, where a banner had compared SBI Buddy’s feature to Paytm. The banner, which read more like a Whatsapp forward and less like the marketing collateral of a national bank, highlighted Paytm’s Chinese ownership, and raised questions about its security. And while there’s some incongruity in centuries-old bank taking on a 6 year old startup, these attacks point to the shifting sands in India’s payments space. SBI was the long established incumbent, with 14,000 branches and nearly 3,00,000 employees across India, but was outflanked in the digital race by nimble startups who built loyal followings for their digital products. Now SBI’s using its heft to get its foot in the door in the digital arena, by blocking transfers to Paytm. As things stand, India’s largest bank now doesn’t allow transfers to India’s largest digital wallet. And while time will tell who’ll win the battle of the wallets – a startup or a 200 year old bank – the loser for now might just be Digital India. Update: SBI had blocked the option to transact through digital wallets in June this year. It’s only now that the issue is being highlighted in light of the recent dependence on Paytm and other digital transactions.